Israeli army vehicles invaded, on Thursday at dawn, Aqabah village in Tubas, and the Old Askar refugee camp, in Nablus, searched several homes and abducted two Palestinians. The soldiers also invaded a home in Jerusalem, and violently searched it. In Tubas district, in central West Bank, the soldiers invaded and searched several homes, interrogated many young men, while inspecting their ID cards and kidnapped one. The Tubas office of the Palestinian Prisoners’ Society (PPS) said the abducted young man has been identified as Omar Waleed Abu ‘Arra. It added that the soldiers interrogated the Palestinian and his family for an extended period, while violently searching their property. The soldiers also invaded and ransacked several homes in the village, and interrogated the families. Owner of one of the invaded homes have been identified as Mostafa Abu ‘Arra. 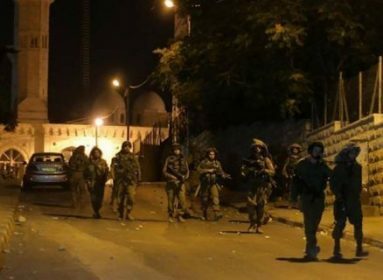 In addition, the soldiers invaded the Old Askar refugee camp, east of the northern West Bank city of Nablus, also stormed and violently searched homes and abducted one Palestinian. The Nablus office of the PPS said the abducted young man, identified as Ahmad Saqer, is a former political prison. In related news, the soldiers invaded a home in Jabal al-Mokabber, in occupied East Jerusalem, and violently searched it causing excessive property damage.